Add some fun to your Christmas with this tropical version of a jolly greeting with the Ho Ho Ho Holiday Sea Turtle Dog Shirt in Red! 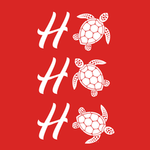 The Ho Ho Ho Holiday Sea Turtle Dog Shirt in Red will bring out smiles during your outings and this holiday season at the beach! This dog tank top features a sleeveless style with a high-cut, stay-dry belly for the ultimate comfort and convenience. This exclusive design is printed right here in our BaxterBoo.com T-shirt Shop for your dog and is available in a wide range of sizes to outfit the whole pack! The 100% cotton is breathable and comfortable. Machine wash cold and dry flat for best results. Great for Christmas gifts and stocking stuffers! Posted On 02/06/19 by Michelle E from Cleveland , TN Yes, Michelle E recommends this product! Good material, Cute and true to size. I was pleased, I was looking for light weight inexpensive dog booties to protect my dogs paws from the hot pavement. I found booties for $20 without breaking the bank (I have two dogs to buy for).